Several petitions submitted to the White House’s We the People website during the past year asked for information to be released about UFOs and extraterrestrials. And, although only one of his petitions has successfully reached the required number of signatures to earn an official response, Steve Bassett of the Paradigm Research Group just launched his fifth petition on the website. This latest attempt asks for the Obama administration to re-investigate the alleged crash of an extraterrestrial craft near Roswell, New Mexico in 1947. 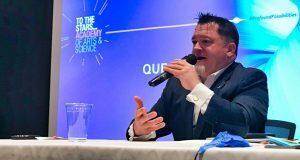 Sharman’s petition is the only one of its kind in the UK, and he is going to actively attempt to engage the British population on the UFO subject by touring towns and cities all over the country during the next year, giving presentations on the subject, free of charge. U.S. petitions submitted to We the People require 25,000 signatures in one month to merit an official response from the White House. 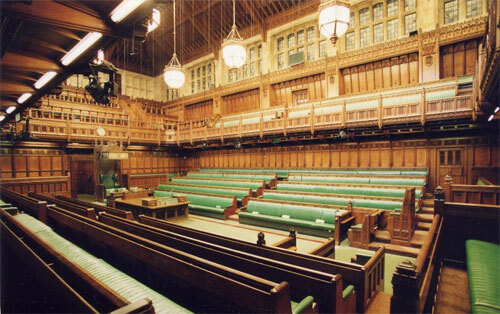 Sharman’s petition to the UK government has a longer time frame, but within the one-year period, 100,000 signatures must be achieved for the issue to be considered for debate in the House of Commons. The benefit of these petitions is debatable. 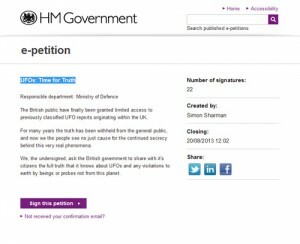 Some truly believe petitions like these will incite meaningful change, and will result in the disclosure of secret information from governments. Others, however, think it highly unlikely that governments will openly admit a history of public deception, petitions or not. What do you think about the efforts of those submitting petitions like the ones mentioned in this article? Is there any chance they will be productive, or are they a waste of time? Share your comments with us below, or on the Open Minds facebook page. I think all we can do is petition, for the record books. Although just as you said, it’s ‘highly unlikely governments will openly admit a history of public deception’. This subject and the inevitability of a full disclosure will come no-matter what. Whether a major event occurs involving UFO’s in real time or that key document is leaked in some manner. To those that say petitions do no good, I look forward to hearing your suggestions – or better yet Efforts – in the fight to discover what truths may be hidden. Although I agree that petitions alone will not lift any veil of secrecy, we do live in a democracy and what is the use of doing so if we don’t USE our freedoms? 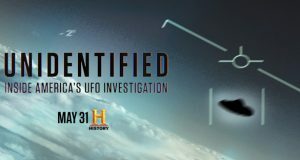 My petition – UFOs: Time for Truth also serves a second a vital function: it helps to me to engage the population in this subject that deserves so much more respect than it receives. I agree that increasing public awareness is great. But, unfortunately, these petitions garner very little attention outside the existing community of UFO proponents. It’s really stupid, sorry, to create a petition and not succeed ! 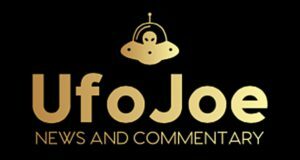 It should be prepared few month before by creating partnership with a lot of ufo related websites around the world ! Every website could prepare his visitors to this event! I am in europe, i’m really interested by this subject but I think there should be more union and preparation! Its good to keep hassling the governments about the subject but they simply have too much to lose by letting the public know the truth. Religion, Finance, Free energy, World order and outright panic are the main reasons the truth is witheld. Add to that the governments deceit over the last 100 years and its easy to see why they would likely never disclose the truth. Its sad, but if we even struggle to get on with different race’s and religions in our own species how the hell are we going to handle dealing with lifeforms from a different planet.